Russian President Dmitry Medvedev has stressed during a visit to the West Bank that Russia recognized an independent Palestinian state in 1988 and is not changing that position. 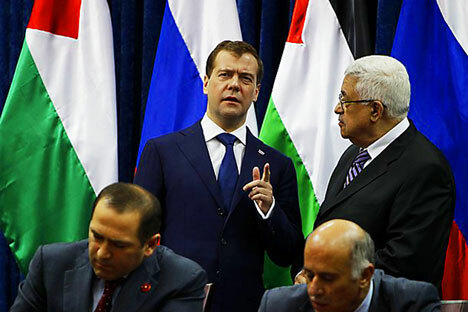 Speaking at a news conference with Palestinian President Mahmud Abbas in Jericho, Medvedev said: "We made our decision then and we have not changed it today." Medvedev is in the West Bank for talks with Palestinian leaders on how to revive the Israeli-Palestinian peace process. At the press conference, Medvedev also said there will be no progress in those talks without a "reasonable" Israel decision on Jewish settlement activity. "We discussed the prospects of resuming the dialogue and what is required for that," Medvedev said. "The parties need to show maximum restraint and respect their commitments. I'm talking particularly about Israel freezing its settlement activities in the West Bank and East Jerusalem." Russia is a member of the Quartet of Middle East peace mediators -- which also includes the United Nations, the United States, and the European Union -- and wants to play a more active diplomatic role in the region. U.S.-brokered peace talks stalled last year when Palestinians walked out of the direct talks after Israel refused to extend a freeze on construction of Jewish settlements in the West Bank. Medvedev continues his Middle East tour with a visit to Jordan. He had been due to go to Israel as well, but that visit was postponed when Israeli Foreign Ministry staff went on strike. Copyright (c) 2011. RFE/RL, Inc. Reprinted with the permission of Radio Free Europe/Radio Liberty, 1201 Connecticut Ave., N.W. Washington DC 20036.